The last time I wore this sleeveless leopard print top with a black sequin neckline I was going to see a band. Today I wore it to work, thanks to the magic of my favorite Target 3/4 sleeve black cardigan. The top’s banded bottom blouses out at the waist, much like yesterday’s top, which maybe isn’t so flattering, especially with the black chair arm just peeking out behind my side making me look wider. So this is what my office looks like. Yep, a whole bunch of cubicles plus some offices — with doors! — around the edge. Two floors, about 175 of us in the building. I’m not standing in front of my own cubicle. My chair is lesser quality than that one because earlier this year there was a shipment of new chairs and they were assigned by tenure. Not based on years with the parent company, mind you (I was at 5 years), but with this specific business line (1.5 years). Who orders nice chairs and only gives them to some employees on a team and not others? Why would any manager think that’s a good idea? My chair became even crappier last month after I came back to a conference room after stepping out to find my own chair gone and the dirtier, squeakier one that is now mine in its place. Hooray for work! October 6, 2010. Tags: clothes, Target, What I Wore to Work Today. Projects, What I Wore to Work Today, Words. 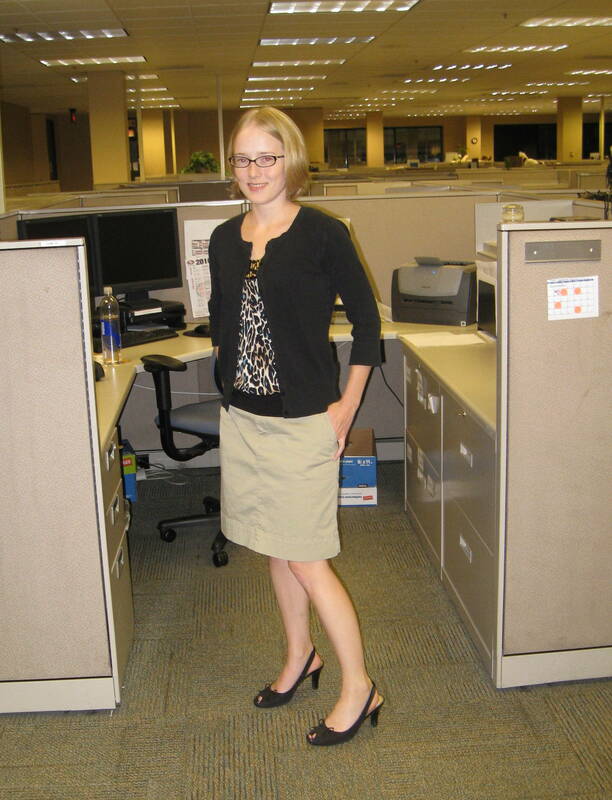 Looking sharp, the black band and sequins on the blouse are fun, seeing a cubicle is great. Maybe a new chair from the family for your b-day is in order! Glad you have photographers willing and able to shoot for you. October 6, 2010 at 7:16 am. Permalink.